Los Gigantes (Spanish for “The Giants”) gives name to a beautiful secluded beach located on the western coast of Tenerife island in the Canarian archipelago, Spain. This resort area offers diverse options for holiday accommodation including apartments, hotels and aparthotels which afford privileged views to both the ocean and the breathtaking Los Gigantes cliffs. Such unique scenery can be found in the municipality of Santiago del Teide, 11 kilometres away from the city centre and about 34 kilometres from Tenerife South International airport. Without a doubt, this area is ideal for travellers who want to disconnect from the world during their vacation in the Canary Islands, but also for those eager to take boat trips that will give them the opportunity to watch wild dolphins and whales, join hiking excursions to Mount Teide or Masca, and enrol in water activities such as snorkelling and canoeing. Besides, Los Gigantes lies within easy reach of other beaches like Playa de la Arena, Puerto de Santiago Harbour and plenty of local shops and dining outlets scattered along the beach promenade. Should you wish to plan for your holiday in Tenerife already, we have gathered a selection of different types of accommodation near Los Gigantes for you to choose the one that suits your preferences, whether you are looking for a low-cost retreat, an adventure escape or a luxury stay. The known as Vigilia Park is a budget resort in Tenerife providing guests with outstanding amenities so that they have everything they might need on site and do not need to leave the facilities unless they feel like exploring the beautiful surroundings. Some of the amenities, though, may require the payment of a surcharge, always giving travellers the chance to decide whether they want to include them in their nightly rate or not. By way of example, they are offered airport shuttle services, WiFi internet and safes at a small additional cost in case they decide to use them. Enjoying the daily buffet breakfast also implies the payment of a nominal fee. In order not to miss out on the wonderful sights surrounding the resort, guests staying in these apartments in Los Gigantes -Tenerife– are invited to spend time at the rooftop pool, have a drink at the poolside bar, and visit the gym and the sauna inside the premises. The accommodation is family-friendly and has kid meals available as well as zones specifically designated for children, while units have been designed and arranged to accommodate up to seven people in three-bedroom apartments, two-bedroom ones and one-bedroom ones, all of which feature large double beds, sofa-beds and spacious living areas. Guests of the Bahía Flamingo hotel enjoy a strategic situation in Puerto Santiago that allows for stunning views and direct connections to sites of interest around the island, all of it within short walking distance of the beach. 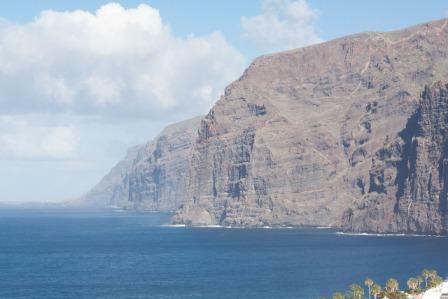 Los Gigantes cliffs, Masca, Punta de Teno and Mount Teide can all be reached from this area, either by ground transportation or as part of a hiking trip. The establishment also has a vast array of both complimentary and payment amenities among which we count wireless internet, breakfast buffet, laundry, safety deposit boxes, car rental service and parking spaces. Furthermore, the staff at the front desk will gladly assist you regarding tourist information and directions to get around Tenerife island. This hotel near Los Gigantes cliffs boasts an outdoor swimming pool that stays available all year round and most of its rooms feature a private balcony affording spectacular sea or pool views. Units can be double, triple or family ones, and have been fully-equipped so as to cater to the needs of holiday goers living up to our expectations about a 3-star holiday resort. The hotel known as Be Live Experience Playa La Arena provides private access to the beach, an outdoor pool, an onsite bar, a restaurant specialising in Mediterranean dishes, a buffet-style restaurant, a fitness centre, a massage salon, sports facilities, night entertainment and an extensive menu of services available at the front desk for confirmed guests. The double, triple and superior rooms of this hotel in Los Gigantes –Tenerife– are well-appointed and feature coffee machine and en suite bathroom, affording breathtaking ocean views and featuring arrangements and occupancy to accommodate couples, groups and families. If you are hiring a car to get around Tenerife during your holiday in the Canary Islands, we advise you to ask about parking spaces for guests at the reception, where they will assist you with this and any other queries you may have. Next How many airports are there in London, UK?